Our posture is key to feeling great in our bodies. Mountain pose, or Tadasana in Sanskrit, is the blue print for great posture and teaches us the foundation of most standing poses in yoga. It’s easy to do, yet vital for the health of our spine. This basic pose is named mountain for its characteristics of strength, stability, and stillness for a lifetime of healthy practice. This pose begins most yoga sessions to steady ourselves, invoke alertness, and shift our minds from the busyness of the day to the present moment. It requires little effort so any one can do this pose. It can help us maintain correct alignment in many standing poses, and is also a great way to rest and refocus between postures. Stand with your big toes touching and heels slightly apart. Your arms are down along side the torso, palms facing forward. Lift and spread your toes, then release them to the mat. Feel your weight balanced evenly between the front, back, and sides of the feet. Lift the inner arches of your feet as you firm the outer ankles in. Contract the thighs upward by lifting the kneecaps. Spiral your inner thighs backward as you lengthen the tailbone down. This will help to lengthen the low back and engage your core muscles. Grow taller through the sides of the waist. Lift the chest toward the ceiling, as you soften the front ribs back. Draw the shoulder heads back and down. Align your ears over your shoulders. 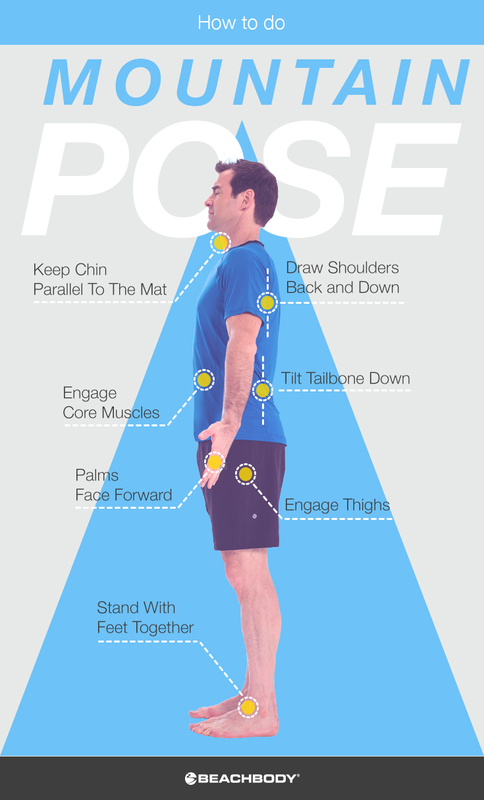 Balance the head directly over the pelvis and the pelvis directly over the ankles. Chin is parallel to the mat. You can do this pose with your feet hip distance apart if you feel off balance with your feet together. Make sure you align your knees with the second and third toes. To make this pose easier, you can practice it against a wall to align the bony platforms of the body – the back of your heels, the sacrum and the shoulder blades. Your head may or may not be against the wall. To make this pose harder, close your eyes, take deep breaths and be still and steady. You can find Mountain Pose in many Beachbody On Demand programs, such as 3 Week Yoga Retreat and Beachbody Yoga Studio.